When the City Council approved San Antonio’s first tree-preservation ordinance in 1997, there was no question the rules applied to real estate developers. But what happens when a property owner claims he’s not a developer, and hundreds of acres of trees are bulldozed on his land as part of a ranching operation? In the case of Hugo Gutierrez Jr., the answer is: nothing. The tree ordinance didn’t apply to him — and it might not apply to developers who try the same thing. The case highlights a potential loophole in the preservation standards that can be used by other real estate developers, many of whom criticize the city’s rules as excessive and expensive. Environmentalists complain San Antonio’s tree canopy is rapidly disappearing. They said Gutierrez’s case illustrates a way around the city tree ordinance, which requires developers to save trees and pay mitigation costs. As if the state legislature hasn't hobbled local communities enough with the vast loopholes that fit under "vested rights." Read on for the gory details, and plenty of them. "My suggestion of what we'll do, and I intend to talk to our City Council about it, is that we create, by ordinance, a provision that when an agricultural property is cleared of trees, and then sold to a developer, then that becomes a taxable event. So that you have to pay the mitigation damages. Because it's no longer being used for agricultural land." Hardberger acknowledged his proposal will be challenged in court by the real estate community. "It's certainly possible it will be challenged," the mayor said. "I would anticipate it would be challenged because it's a pretty sweet deal now." Hardberger said he will also ask Bexar County legislators to write a bill that would amend Texas law to help the city's cause. "I doubt when the Legislature was trying to protect agricultural land, I doubt if they envisioned that (ranchers will) clear all the trees and sell it to a developer. That probably was not envisioned. I think there will be legislators who will be willing to close that loophole." Hardberger said he will also direct lobbyists who represent the city to support such legislation. "One thing I'm not going to do is just to sit here for the last year of office and watch trees be cleared on a grand scale and feel like there's nothing we can do but wring our hands," Hardberger said. "I'm not going to do that. I'm going to take action." Will the Legislature block any attempts to rein in the bad practices of real estate developers yet again? The rate of land-trashing by real estate developers in northwest Bexar County has reached the stage where it threatens the continued existence of an amy training ground, Camp Bullis. This threat has compelled both the City of San Antonio and the U.S. Army to act, which, finally, has brought some attention to the issue -- though, alas, not in a general sense. Plenty of formerly beautiful Hill Country terrain and wildlife habitat has been scraped and blasted into nothingness in recent years without raising much alarm from anyone but those of us in the immediate area. A federal judge Friday ordered a San Antonio-area developer to cease road-clearing operations for a new subdivision adjacent to Camp Bullis, giving wildlife experts time to evaluate the project's impact on golden-cheeked warbler habitat. U.S. District Judge Xavier Rodriguez granted a temporary restraining order against INTCO-Dominion Partnership and set a hearing for 10 a.m. Wednesday on an environmental group's request for a permanent injunction that would halt development next to the range. The lawsuit, filed Friday by Aquifer Guardians in Urban Areas, contends that INTCO is destroying dense trees and brush that are home to the endangered migratory bird that nests each spring and summer in the Hill Country. Destroying warbler habitat is a violation of the Endangered Species Act. INTCO has been clearing trees and brush on the 340-acre site near Bullis as it prepares to build a road for a high-end subdivision. The company's Austin-based attorney, Allen Glen, said it was “a safe assumption” his client would follow the order and suspend work. Critics of INTCO say the project, and others like it, are driving the warbler onto Camp Bullis, and that if the trend isn't stopped the Army will be unable to train on the 27,994-acre range. As growth has exploded in the area, the warbler population on Bullis has nearly doubled from 672 in 2001 to 1,086 in 2007. Fort Sam and top city and county leaders say any reduction of training area raises the risk of the Army moving 37,250 military and civilian workers to be on the post by 2011. “The issue is bigger, of course, than the fate of the warbler. It's concern about development around Camp Bullis and, of course, the impact on the aquifer recharge zone,” Aquifer Guardians' Valdivia said. Federal law and Defense Department policy forbid the Army from taking legal action, forcing it to rely on groups such as the Aquifer Guardians and the Greater Edwards Aquifer Alliance, which had considered seeking the restraining order. Post spokesman Phil Reidinger said court action is the only way to stop work on the site while biologists take a closer look, and added that Fort Sam “cannot shoulder the conservation burden alone” — a view shared by its advocates. Literally, mud fell from the sky here in San Antonio last Tuesday. I have no experience with that kind of weather phenomenon before, so I didn't know what to make of it. My first impression upon seeing my car, after emerging from my office late that afternoon, was "My car is spattered in mud from top to bottom! How did this happen? Did some huge truck drive though a deep puddle at high speed?" With no such large puddle nearby and thus no evidence that such a thing could have happened, I then noted that I had parked underneath a large live oak tree and that it is spring and rationalized that trees are messy in the spring. Then I promptly put it out of my mind, while driving to the nearest gas station to clean off the windows that I could barely see through. There, some puzzlement returned as I noted that the line for the car wash was six deep. The strange stuff that fell Tuesday, griming up windows and lining the pockets of carwash owners, has had the additional effect of setting up a sort of meteorological whodunit. Just what, some scientific sleuths want to know, commingled with the rain as it fell onto vehicles from San Antonio to Corpus Christi, from Austin to Houston? Some initial reports, including one from a National Weather Service meteorologist, had the primary cause of the deposits as ash from wildfires in Mexico. Other indications, including satellite photos, showed a dust plume also emerging from central Mexico. Another additive to the mix washed from the sky by the rain of a fast-moving cold front may have been particles from bone-dry West Texas. Forrest Mims III, a science consultant and a freelance columnist for the Express-News, took a sample of the stuff from his window and put it under the microscope, forwarding some of his findings to TCEQ. "There's one black spore and there are three possible soot particles and everything else is dirt, dust, sand. I would say that it's probably less than 1 percent smoke, and that's being generous," he said. David Gay, acting director of the Illinois-based National Atmospheric Deposition Program, said his government-funded network of researchers had five sample sites in South Texas and would be able to review initial findings as early as next week. To me and, I suspect, most others here, it is much more plausible that the stuff in the rain was dust and not ash, as was apparently first reported. The brownish, rusty color of the residue just does not fit the concept of dull gray ash. So what is going on in west Texas or northern Mexico that their dirt is falling on our city? 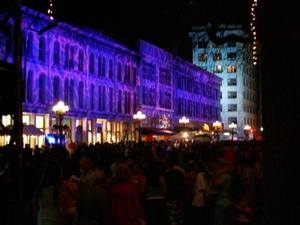 Here are a few of my photos from the first Luminaria arts and music festival, downtown San Antonio, Saturday, March 15, 2008. There was way too much going on to come close to seeing and doing all I wanted to. If the city this again (and I sure hope they do), perhaps they could split it up into a couple weekend evenings, instead of just one. It was a blast. 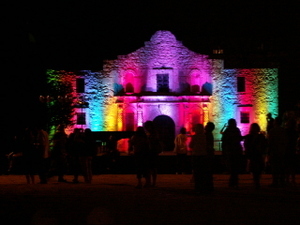 Luminaria is the first annual all day and evening celebration of San Antonio premiere artists and art organizations giving citizens of the community a chance to experience the city’s diverse cultures through observing and participating in our world-class artistic heritage. Through visual, performing, multi-media, theatre, dance, music and other artistic forms, audiences will be engaged throughout San Antonio in a free, world-class celebration of the arts. 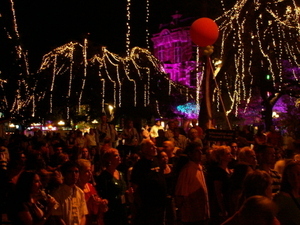 Luminaria is intended to be a cohesive celebration of the arts through a creative atmosphere showcasing San Antonio’s diverse artistic community. An artist-driven celebration of the arts, Luminaria is an unprecedented collaboration of over 40 non-profit organizations that will come together for 1 day to celebrate the dynamic vitality of San Antonio’s creative spirit. 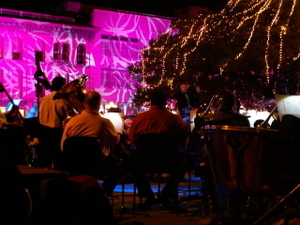 Based on the success of other international celebrations such as Nuit Blanche in Paris and Noche Blanca in Madrid, no other city in Texas has attempted to coordinate continuous artistic, educational and innovative programming for a city-wide arts celebration. To further highlight the name of this event, the traditional role of the luminaria is a clever small light that conjures up creative ideas which inspires waves of innovation. 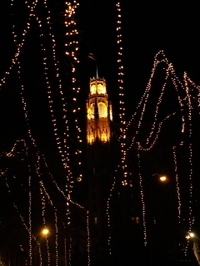 Here is a list of events taking place downtown from 6pm to midnight tonight. 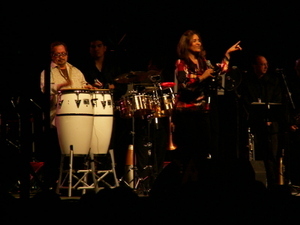 It is an impressive list that includes six venues for performances. 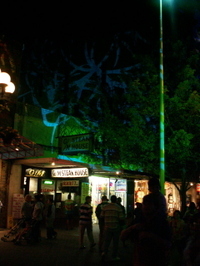 I just found out about this festival, but hopefully will get a chance to catch part of this tonight. It looks like great fun. For more, here is an article in the Express-News about the festival. "Where were you all last time?" Where were you all last time we had one of these things, when we had like four people! A few days ago, I noticed that Barack Obama and Hillary Clinton were planning rallies in San Antonio for the weekend. I was hoping to attend both of them -- after all, it is pretty rare that my state is involved in such a heated primary race between two stellar candidates. Sadly, they managed to schedule both rallies for exactly the same time last night, but twenty miles apart. My plans were foiled -- I had to pick one and only one. 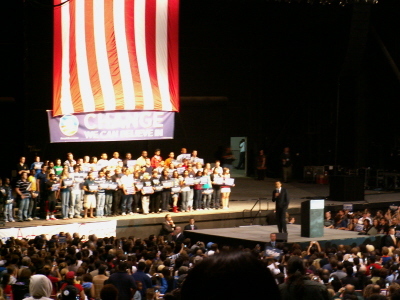 Being a supporter of Obama's, I picked his rally, even though it was far less convenient. 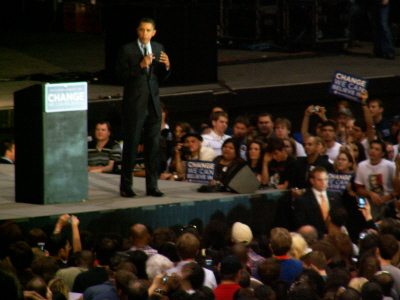 The venue for Obama was the Verizon Wireless Amphitheater, far out on the northeast side. Driving all the way across town at rush hour was not appealing, but the rarity of the moment won out, and I put up with it. I was amazed at the number of volunteers helping out -- hawking t-shirts and buttons, handing out "tickets" and pens (the price of admission was your contact information), and, mostly, seeking to sign up additional volunteers. I tried to get some pictures, but was not quite close enough to get decent ones. Darn those big crowds! The Express-News quotes a crowd size of about 8,000 people, and that strikes me as roughly correct. It was by far the largest political rally I've been to -- perhaps too large to be an ideal rally, as it is difficult to fully engage those who are far away physically from the speakers and the candidate. 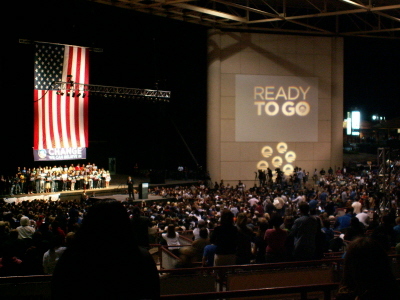 And I had no prayer of getting up close enough at the end to shake the candidate's hand, as I had managed to do at the John Kerry rally in March 2004 and the Bill Clinton rally for Ciro Rodriguez in 2006. Still, it appears a good time was had by all. I am sorry I won't be able to attend a Hillary Clinton rally, though. Any chance she'll be back before Tuesday seems quite slim. And at this point, I have to admit that I am ready for this primary season to be over after that.